Skin - Visual Dictionary - Copyright © 2005-2016 - All rights reserved. [img]https://infovisual.info//storage/app/media/03/img_en/036 Cross section of skin.jpg[/img] [url=https://infovisual.info/en][/url] - [url=http://www.infovisual.info/]Visual Dictionary[/url] - Copyright © 2005-2016 - All rights reserved. Dermins or true skin: middle layer of the skin. Subcutaneous tissue: deep subcutaneous layer. Connective tissue: tissue that consists of cells and fibres and which connects and supports. Matrix: cells that allow hair growth copyright bernard dery infovisual. Nerve ending: part of the skin that senses stimuli. Adipose tissue (fat): fat-producing cells. Arteriole: network of blood vessels that carries blood from the heart to the organs. Venule: network of blood vessels that carries blood from the organs to the heart. Sweat gland: gland that produces and secretes sweat. Pilo erectile muscle: muscle that elevates the hair. Capillaries: blood vessels that allow the exchange of various nutriments and wastes among cells. Sweat pore: minute hole that secretes perspiration. 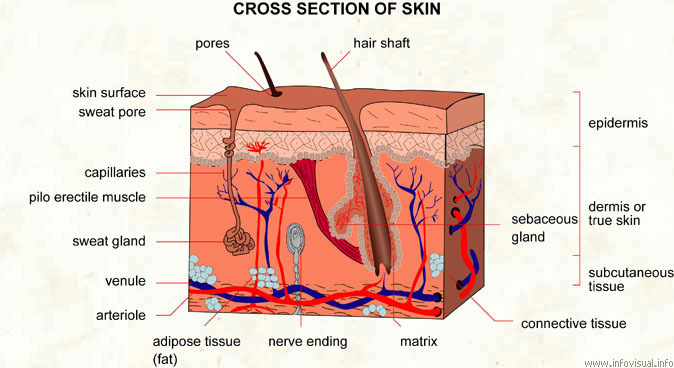 Skin surface: top of the epidermis.